If you must take antibiotics for a bacterial infection you should know that along with the harmful bacteria, antibiotics also wipe out "good" bacteria that live in your digestive tract including Lactobacillus acidophilus and Bifidobacteria. Gas, diarrhea, and bloating are common immediate side effects of antibiotic use. This disruption in the ecology of your gut can even lead to the development of food sensitivities, Candida yeast overgrowth, or other inflammatory conditions. When there are enough of these beneficial microbes, they make it an inhospitable environment for harmful bacteria, yeasts and parasites. Probiotics appear to help enhance the immune system and offer protection from bacteria and viruses that cause GI illnesses. During antibiotic therapy you will likely need a more concentrated source of probiotics than what common food sources can provide. Look for probiotic drinks, pills, or powders that provide around 1 to 10 billion live cells per serving and have guaranteed potency (meaning they are alive) through the expiration date, not until you buy them. 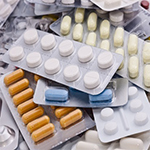 Higher doses may be indicated during long term antibiotic therapy. A knowledgeable healthcare provider can recommend the appropriate dose and probiotic strains. Finally, take probiotics as many hours as possible in between doses of antibiotic and take them for at least a few days to a few weeks after you finish your antibiotic therapy.